Amorevore brought together a fantastic food fandango with both a lighthearted and serious note. Three days of all things food in the simply lovely setting of a rural Ibiza hotel. Just writing about it is making me hungry. This was Amorevore, which put on a wide and varied programme at Casa Maca, just outside Ibiza Town last weekend. Unlike most food festivals, this one had a real leading mission to promote, present and discuss local, seasonal and sustainable food and drink as well as highlight global food issues. Eating with a conscience is becoming increasingly important as we re-calibrate our relationship with food and diet. This event really brought together the very best and most advanced thinking in this area with plenty of food to enjoy and lots to entertain. Amorevore was a true cavalcade of the great and the good of food and nutrition with names like Valentine Warner and food writer Jasmine Hemsley. The setting was perfect, surrounded by nature with pomegranate, olive, almond and carob trees representing Ibiza's own food story with the added allure of lavender fields wafting in the gentle breeze. Various stalls selling locally-produced food were there too, including organic and sustainably produced fruit and vegetables, olive oil producers, even a selection of local chilli sauces were on display. Then of course there were lots of places offering food to eat, all offering great quality, using of course sustainably produced ingredients. A series of symposiums and workshops looking into a variety of topics really did cover everything. On Friday, a rigorous debate on veganism was a truly sensible discussion going beyond the war of words between vociferous vegans and pro-meat eaters. Hint, it's a mix of good animal welfare, biodiversity and responsible ways to eat meat as well as the benefits of a plant-based diet - an approach to be applauded. Earlier the talk by Patrick Holford and his anti-pharma “rap” gave a bit of a laugh as well as inspiration to the area of good nutrition. 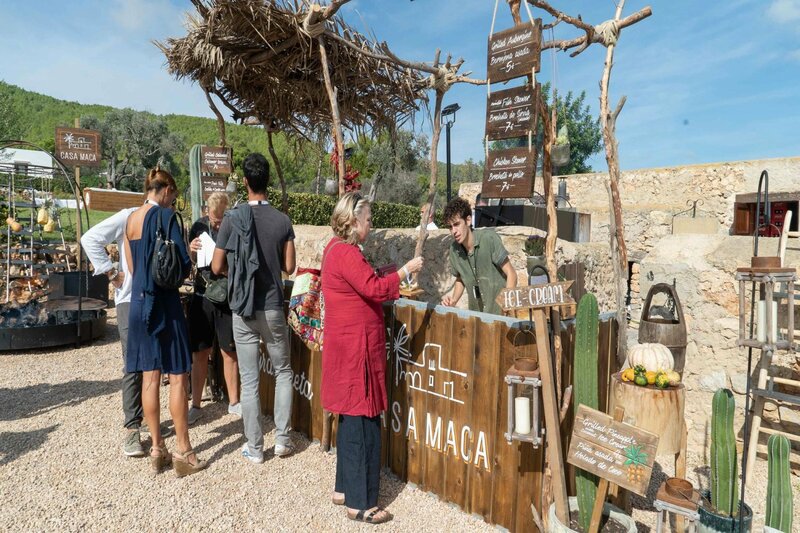 On the Saturday and Sunday there were talks as various as Ibiza's food heritage, with Ibiza's food queen Anne Sijmonsbergen, to the future of cooking in the Balearics to global food production. Beyond these more concerning of issues were workshops on pasta making, cooking fish over a wood fire and biodynamic wine tasting. Live music, art and a kids zone, which also taught the little ones about good diets, offered plenty to amuse. Amorevore deserves to be a firm fixture on the Ibiza calendar; it truly gives something back to the island and the world beyond. Perhaps its motto could be: eat, drink and be merry and love the world around you. Look out for the next one!